So, like many others it seems my center console lid won't open without force. I've looked over threads on here, but wasn't able to find one with a solution. 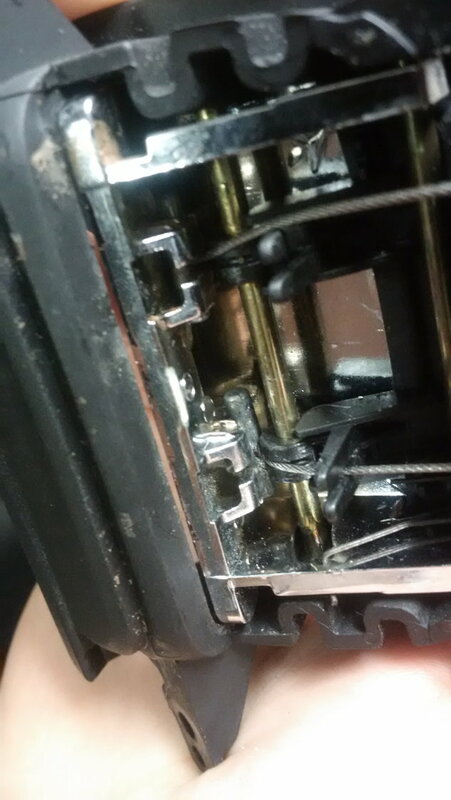 I pulled the handle off mine today to investigate and the wire that connects the lever to the latches is identical to the wire that actuated the sliding motion. The wire leading to the latches is attached to a bar which was originally fitted in a crevice in the handle, but it is now loose. It does not appear that the bar was originally snapped in, but I can't seem to figure out how it is supposed to be attached and what would work to keep it held in. Any suggestions from people who have had this problem? Are you in the right forum? This is the X150 Forum, for 2007-up XK/XKR models. What year is yours? If this is for an X150, I have the console issue too, but no solution. I have no idea as mine works fine but in your picture one of the wires is not in place. Don't know if this thread is still active, but I have a problem with my console handle also on my 2007 XKR convertible. It appears from your picture that the plastic tab holding the little cross rod has not completely deteriorated but is loose enough that the cable is not pulled enough to function properly. My tab is a bit more damaged so that I could not open the lid. I have put out requests to see if anyone has a console in poor enough condition that I can get the handle for a reasonable price since the dealer answer is a new assembly for $1,000 more or less. My alternative is to try some plastic welding and build up the plastic enough to hold the cross rod but I have not yet attempted this. Has anyone found a source for the handle without the entire console?